Archbishop William Laud (October 7, 1573 - January 10, 1645) was Archbishop of Canterbury from 1633 to 1645 after serving successively as Bishop of St. David's, Bath and Wells and London. Previously, he was Dean of Gloucester. He pursued a High Church course and opposed radical forms of Puritanism. This and his support for King Charles I resulted in his beheading in the middle of the English Civil War. He reformed the University of Oxford, of which he was Chancellor 1630–1641, where he also established a chair in Arabic. From 1611 until 1622, when he first took up Episcopal office, he was President of St John's College, Oxford, his alma mater. Like many others of his era, Laud was over zealous in enforcing his version of Christianity. This impacted directly on the shape that the Church took in Scotland, where it adopted the Presbyterian model. Appointed a Privy Councilor in 1626, he became one of the most powerful and influential men in England. He was First Lord of the Treasury 1635–1636. Laud wanted the reconciliation of all Christians, hoped and prayed for unity but believed that unity required uniformity, which denied diversity and variety. Subsequently, Anglicans have become more tolerant of the notion of unity in diversity, which has been described as a cherished Anglican tradition. Laud's instinct towards reconciliation and unity was generous, although the tumultuous times in which he lived mitigated against putting this into practice. Yet Laud's legacy also did much to shape the Church he served; the Church of England kept the liturgy he loved, continued to regard itself as part of the apostolic church and, as Laud had insisted, of the Catholic Church, with bishops in apostolic succession. This later enabled the Anglican Communion to become a type of ecclesiastical bridge between different traditions, such as the Roman Catholic, Eastern Orthodox, and Protestant churches. Anglicans in different parts of the world, too, have entered unions with others within United Churches, which honor many of the traditions Laud had championed and defended, arguably with his life. Laud was born in Reading, Berkshire, of comparatively low origins, his father, also William, having been a cloth merchant (a fact about which he was to remain sensitive throughout his career). He was baptized at St Laurence's Church in Reading and educated at Reading School and, through a White Scholarship, St John's College, Oxford. (Sir Thomas White, founder of St. John’s in 1555 was from Reading and established two scholarships for boys from Reading Grammar School.) He entered Oxford in 1589. He has been described as one of the Colleges "most learned and famous sons." He became a Fellow of the College in 1593, graduated with his BA the following year. He gained the BD in 1602 for a thesis on the "efficacy of infant baptism and the need for bishops" and his Doctor of Divinity degree. He spoke of having more or less been "bred up" at St John's and throughout his life tried to repay the debt he owed to the College and to the University. Laud was ordained on April 5, 1601, and took up appointment as chaplain to Charles Blount, 1st Earl of Devon. His Arminian, High Church tendencies and antipathy to Puritanism, combined with his intellectual and organizational brilliance, soon gained him a reputation. He was emphatic in rejecting the doctrine of predestination, writing, "it makes God, the God of all mercies, to be the most fierce and unreasonable tyrant in the world." At that time the Calvinist party was strong in the Church of England and Laud's affirmation of apostolic succession was unpopular in many quarters. In 1605, somewhat against his will, he obliged his patron, by conducting his marriage to a divorcée. In 1607, he became vicar of Stanford in Northamptonshire and the following year chaplain to the bishop of Winchester. In 1610, when he was transferred to Caxton, he resigned his fellowship. Laud continued to rise through the ranks of the clergy, becoming the President of St John's College in 1611; a Prebendary of Lincoln in 1614 and Archdeacon of Huntingdon in 1615. In 1616, he became Dean of Gloucester Cathedral. He offended some by insisting on the wearing of the surplice. He was consecrated Bishop of St David's, Wales in 1622, resigning from St. John's. He was translated as the Bishop of Bath and Wells in 1626. The same year he was appointed a Privy Councilor and made dean of the chapels royal. Two years later he was translated as the Bishop of London (1628). Thanks to patrons, who included the king and George Villiers, 1st Duke of Buckingham, he reached the highest position the Church of England had to offer, the Archbishopric of Canterbury, and with it the Episcopal primacy of All England in 1633. That year, he accompanied Charles on his journey to Scotland to be crowned there and determined to bring what he saw as the lax worship of the Scottish Church into conformity with what he saw as the correct liturgy. As Archbishop of Canterbury he was prominent in government, taking the king's line and that of Thomas Wentworth, Earl of Strafford in all important matters. It is believed that he wrote the controversial Declaration of Sports issued by King Charles in 1633. H. R. Trevor-Roper describes him as the "powerful man in England from 1629 until 1640." Laud dominated the Privy Council. He was First Lord of the Treasury 1635–1636, having given "Charles a list of thirty-one bishops who had been Lord Treasurer between 1066 and 1470, to prove that there were ample precedents for appointing a bishop." In 1630 Laud was elected as Chancellor of the University of Oxford and became much more closely involved in the running of the university than many of his predecessors had been. Laud was instrumental in establishing Oxford's Chair of Arabic, appointing Edward Pococke and took an interest in acquiring Arabic manuscripts for the Bodleian Library. He was also supportive of the study of Hebrew at the University. The chair in Hebrew had only recently been established; Laud believed that "the close study of the original Hebrew of the Old Testament would provide vital support for the Church of England in its doctrinal struggle with the Roman Catholics." He also wanted to make Oxford, known then for "intellectual torpor" a "place for international learning." He was also interested to know more about Christian in the East and to enjoy contact with them. His most significant contribution was the creation of a new set of statutes for the university, a task completed in 1636. The reforms that Laud implemented at Oxford Laud served as the fifth Chancellor of the University of Dublin between 1633 and 1645. He was a great believer in the importance of symbol and of ceremonial and ritual being correctly performed as well as on the wearing of what he considered to be "the right vestments." He wrote, "they are small things, but willful contempt of them, and breach of public order, is no small offense before God" and "without ceremony it is not possible to keep any order or quiet discipline." Hutton says that Laud's description of the Eucharist leaves open the possibility of a "fully Catholic interpretation." Laud wrote, "The Altar is the place of God's presence; and the sacrament commemorates and represents (i.e. presents again in memorial) the great sacrifice offered up by Christ himself." He believed in what he referred to as the "Beauty of holiness" and wanted to ensure that worship was majestic, and ministry properly sacerdotal. This became known as Laudianism. Laud in Cassell's History of the United States. Laud was a sincere Anglican and loyal Englishman, who must have been frustrated at the charges of Popery leveled against him by the Puritan element in the Church. In fact, he rejected the concept of the primacy of Rome, arguing that bishops were equal in status. Some saw the political dangers of Puritanism, Laud saw the threat to the episcopacy. However, the Puritans themselves felt threatened: the Counter-Reformation was succeeding abroad, and the Thirty Years' War was not progressing to the advantage of the Protestants. It was inevitable that in this climate, Laud's aggressive high church policy was seen as a sinister development. A year after Laud's appointment as Archbishop of Canterbury, the ship Griffin left for America, carrying religious dissidents such as Anne Hutchinson, Rev. John Lothropp, and Rev. Zechariah Symmes. Laud's policy was influenced by another aspect of his character: His desire to impose total uniformity on the Church. This, too, was driven by a sincere belief that this was the duty of his office, but, to those of even slightly differing views, it came as persecution. He was convinced that to remain part of the true church, in continuity with the apostolic church, it needed to adhere to the historical creeds. In 1637, William Prynne, John Bastwick, and Henry Burton were convicted of seditious libel and had their ears cropped and their cheeks branded. Prynne reinterpreted the "SL" ("Seditious libeller") branded on his forehead as "Stigmata Laudis." Laud's effort to impose the Book of Common Prayer on the Scottish church following his 1633 visit led to the Bishops Wars of 1639 and 1640, which the Scots won. Subsequently, the Church of Scotland would be non-episcopal. Laud though that churches without bishops lay outside the true church; the Catholic Church, though "corrupt was a true church of Christ" which "raised fears of a crypto-Catholic conspiracy which would make the Church of England an enemy to king and parliament alike." The Long Parliament of 1640 accused him of treason and named him as a chief culprit in the Grand Remonstrance of 1641. Laud was imprisoned in the Tower of London, where he remained throughout the early stages of the English Civil War. In the spring of 1644, he was brought to trial, but it ended without being able to reach a verdict. During the proceeding, he was accused of having changed Charles' coronation oath so as to "deny parliament a role in the making of the law." The parliament took up the issue, and eventually passed a bill of attainder under which he was beheaded on January, 10 1645 on Tower Hill, notwithstanding being granted a royal pardon. Laud requested that his execution be by beheading, not by hanging. He preached a sermon from the scaffold. Until 1660, the Church of England had no bishops and the liturgy that laud loved was suspended. Podmore comments that if this period had lasted longer, the Church of England's "Episcopal succession might have been extinguished." He believed that God had ordained bishops and that while human law could change what is incidental to their calling, the calling itself is "jure divino" and "cannot be taken away." The famous pun "give great praise to the Lord, and little laud to the devil" is a warning to Charles attributed to the official court jester or "fool" Archie Armstrong. Laud was known to be touchy about his diminutive stature. His body was interred in All Hallows Barking. In 1663 his body was moved to St John's, Oxford. In the nineteenth century, the Anglo-Catholic Oxford movement "adopted Laud as their patron saint." The 1940 biography by Trevor-Roper (his first book) was unsympathetic, treating Laud as a "reactionary politician" Laud's legacy is controversial; he has been praised or vilified depending on the perspective of the writer. On the one hand, he did commit excesses in his effort to impose common doctrines and a common liturgy on all Christians in the land. On the other hand, the idea that people should be free to choose their own faith and practice had hardly any support; Oliver Cromwell was equally if not more ruthless in dealing with those with whom he disagreed. On the other hand, what Laud represented is still honored by the Church of England; it continues to honor the liturgy he loved; it continues to regard itself as part of the apostolic church and, as Laud insisted, of the Catholic Church with bishop in apostolic succession. 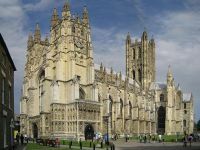 This has enabled the Anglican Communion to become a type of ecclesiastical bridge between different traditions, such as the Catholic, Orthodox and Protestant churches. Laud debated with the Catholic Church but left open the possible of reconciliation. He refused to "join in the fashionable denunciations of Rome." He wrote, "I have ever wished, and heartily prayed for, the unity of the whole Church of Christ, and the peace and reconciliation of torn and divided Christendom" but he believed that this must "preserve all the foundations on religion entre." Laud was indeed conscious of how the Church of England was "between" the Catholic Church on one side, and the Separatists on the other, writing, "She professes the ancient Catholic faith, and yet the Romanists condemns her of novelty in her doctrine; she practices Church government as it hath been in use in all ages and in places where the Church of Christ hath taken any rooting, both in and ever since the apostles' times, and yet the Separatists condemns her for anti-Christinanism in her doctrines." The Communion that Laud played a major role in shaping has played an important and constructive role in fostering ecumenical relations and greater unity among various Christian churches. For example, some non-Anglican bodies have entered into communion with the Anglican Communion, despite having non-Anglican origins and traditions, such as the Old Catholic Church and Lutherans of the Porvoo Communion, the Malankara Mar Thoma Syrian Church and The Evangelical Lutheran Church of Canada. Anglicans in India united with Methodists, Presbyterians, Congregationalists and others to form the Churches of South and North India (where some Baptists also entered the union.) Anglicans have championed ecumenical dialogue. However, they have departed from Laud in valuing unity in diversity. ↑ Brooke, Highfield, and Swaan (1988), 138. ↑ Trevor-Roper (2000), back cover. ↑ Laud and Fisher (1901), xxxvii. ↑ Hefling, and Shattuck (2006), 88. ↑ Laud and Fisher (1901), 229. ↑ Andrew McRae, Literature, Satire and the Early Stuart State (Cambridge, UK: Cambridge University Press, 2004, ISBN 9780521814959), 188. ↑ Pocock, Schochet, and Schwoerer (1996), 114. ↑ Pocock, Schochet, and Schwoerer (1996), 114; Laud, and Fisher (1901), xxxvii. ↑ Pocock, Schochet, and Schwoerer (1996), 115. ↑ The Lectionary Page, The Lessons Appointed for Use on the Feast of William Laud. Archbishop of Canterbury, 1645. Retrieved January 24, 2009. ↑ 22.0 22.1 Carlton. 1987. page 2. ↑ Laud and Fisher (1901), xxvi. ↑ Mark D. Chapman, The Anglican Covenant: Unity and Diversity in the Anglican Communion (London, UK: Mowbray, 2008, ISBN 9780567032539). Brooke, Christopher Nugent Lawrence, J.R.L. Highfield, and Wim Swaan. 1988. Oxford and Cambridge. Cambridge, UK: Cambridge University Press. ISBN 9780521301398. Carlton, Charles. 1987. 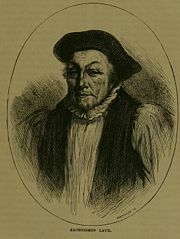 Archbishop William Laud. London, UK: Routledge & Kegan Paul. ISBN 9780710204639. Hefling, Charles C., and Cynthia L. Shattuck. 2006. The Oxford Guide to the Book of Common Prayer: A Worldwide Survey. Oxford, UK: Oxford University Press. ISBN 9780195297560. Hutton, William Holden. 1895. William Laud. Boston, MA: Houghton, Mifflin. Laud, William. 1839. The Autobiography of Dr. William Laud: Archbishop of Canterbury, and Martyr: Collected from his Remains. Oxford, UK: J.H. Parker. Laud, William. 1667. 2006. The Works of the Most Reverend Father in God. Oxford, UK: William Hall. Whitefish, MT: Kessinger. ISBN 9781428607590. Laud, William, and John Fisher. 1686. 1901. A Relation of the Conference Between William Laud, Late Lord Arch-Bishop of Canterbury, and Mr. Fisher the Jesuit. London, UK: Macmillan. Maxwell-Stuart, P.G. 2006. The Archbishops of Canterbury. Stroud, UK: Tempus. ISBN 9780752437286. Pocock, J.G.A., Gordon J. Schochet, and Lois G. Schwoerer. 1996. The Varieties of British political thought, 1500-1800. Cambridge, UK: Cambridge University Press. ISBN 9780521574983. Podmore, Colin. 2005. Aspects of Anglican Identity. London, UK: Church House. ISBN 9780715140741. Trevor-Roper, H.R. 2000. 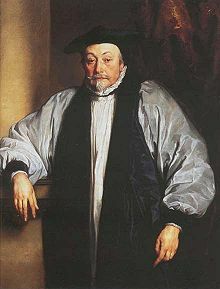 Archbishop Laud, 1573-1645. London, UK: Phoenix Press. ISBN 9781842122020. Royal Berkshire History: William Laud.